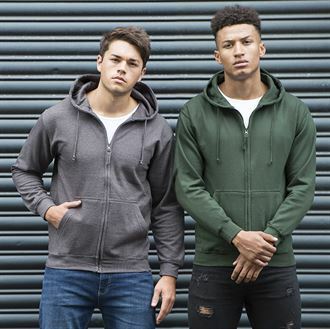 Full zip hoodie with self coloured cords and kangaroo pouch pocket – the right hand side pocket has small hidden opening for ear phone cord feed and hidden ear phone loops. Available in gents’ & lady fit styles in over 20 colours. 80% cotton / 20% polyester. Unit prices inclusive of embroidery of up to 5,000 stitches in one position: 25 units € 21.75 / 50 units € 20.85. Shirts are supplied in bulk – add 30 cent for individual self-seal poly bags. Prices exclude vat @ 23% and one embroidery set-up charge of € 45.00. Delivery charge of €15.00 also applies for delivery to any Irish address. Embroidery prices are approximate and subject to sight of artwork. Cross, Parker & Waterman Pens.